Vassily Ivanchuk - 50 years! And a big tournament about it. Today all chess-lovers celebrate a big holiday – 50th birthday of ukraininan Grandmaster Vassily Ivanchuk, true Chess Wizard and Genius. 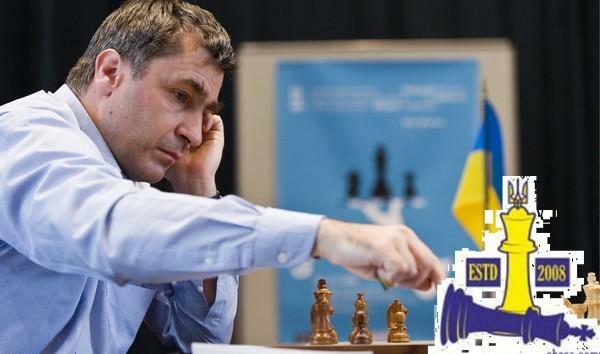 Team Ukraine hosts a big event – online blitz tournament Vassily Ivanchuk Cup. Swiss, 10 rounds, Blitz 3+2 on chess.com. I am delighted to participate in the event as a player, as a streamer and as a jury-member (we will select the best games and give them prizes too). More than one hundred strongest players of Team Ukraine will perform, among them at least twenty are titled. Some of them are familiar with the hero of the day personally. Team Ukraine is one of the strongest teams on chess.com, two-times winner of Live Chess World League. This rare book is Vassily Ivanchuk Cup prize. Number of Prizes – 10 (ten-!) books. 3. Best Games Authors (3 prizes). Two Best games of the tournament are determined by Experts Jury and one game is elected by Poll on this blog. And you will help us with this! Vassily Ivanchuk – was born on 18th of March 1969 in Kopychyntsi town (Ternopil region, Ukraine). twice – as a member of USSR-team (1988, 1990), twice – as a member of Team Ukraine (2004, 2010). World Champion in Blitz (2007), World Champion in Rapid (2016), European Champion (2004), in 2002 was in one step away from the crown of the FIDE World Champion, but lost the match against another Ukrainian genius, Ruslan Ponomarev. Who is the best ever chessplayer in the world? Obviously, Vassily Ivanchuk in a good shape! as an obstacle. I adore his genious! Why do we love Ivanchuk? To my mind - for his devotion to Chess as an Art! Congrats to the World Rapid! He surprised me many times at the board; now he’s teaching a whole new generation. Vassily Ivanchuk won Linares was 21 years ago. The first time he won, Magnus Carlsen was not yet born. for creating the tournament and this blog. Chess Team Ukraine. Украина-Казахстан. Полуфинал мировой лиги по блицу. Chess Team Ukraine. Украина-Казахстан. Интересные игры. Chess Team Ukraine TV. Украина-Никарагуа: сенсация в 1 раунде? Chess Team Ukraine TV. Украина - Чехия. Нет интриги. Chess Team Ukraine TV. Украина - Мексика. Игра на раздевание. Chess Team Ukraine TV. Украина - Перу. Катастрофа лидеров. Chess Team Ukraine TV. И снова Сербия. Полуфинал по рапиду. Chess Team Ukraine TV. Украина - Россия. Самый главный матч. Chess Team Ukraine TV. Украина - чемпион по буллету! Chess Team Ukraine TV. Сербия. Легендарный полуфинал. Chess Team Ukraine TV. Схватка чемпионов. Суперматч! Chess Team Ukraine TV. Все о шахматах в Исландии. Chess Team Ukraine TV. Досрочная победа в чемпионате буллет! Chess Team Ukraine TV. Франция - Украина. Разведка боем. Chess Team Ukraine TV. Викинги против козаков! Chess Team Ukraine TV. Украина - Сербия. Матч по шахматам рапид.